Scott Sommerdorf | The Salt Lake Tribune Rep. Justin Fawson, R-North Ogden, in the Utah House of Representatives, Wednesday, January 28, 2015. Gov. Gary Herbert on Monday signed into law HB196, which makes it crystal clear that breastfeeding is legal in public places. After removing language that some lawmakers had worried could lead to immodest behavior, the Utah House advanced a bill Wednesday designed to make it crystal clear that breast-feeding is legal in public places. Representatives voted 66-5 to pass HB196, and sent it to the Senate for consideration. Rep. Justin Fawson, R-North Ogden, its sponsor, amended out some language that created controversy in an earlier hearing. With the amendment — made without comment on the floor — Fawson was the only one to speak about the bill during brief debate Wednesday before passage. He said the bill clearly “permits a woman to breast-feed in any place of public accommodation,” as he said 48 others states already do. Fawson complained that mothers now often are relegated to restrooms to breast-feed. “I would ask you when the last time you had a meal in a restroom was. I would say probably never. It’s not a very comfortable place to hang out,” he said. Fawson said mothers should be confident in the ability to feed their children anywhere. Despite concerns that it might allow immodest behavior, a bill advanced on a close vote Thursday to make it crystal clear that breast-feeding is legal in public places. The House Business and Labor Committee voted 6-5 for HB196, and sent it to the full House. “I don’t feel that we should ever relegate a woman to a restroom to breast-feed her child,” said Rep. Justin Fawson, R-North Ogden, sponsor of the bill. But he and others said some businesses now ask women to go there. 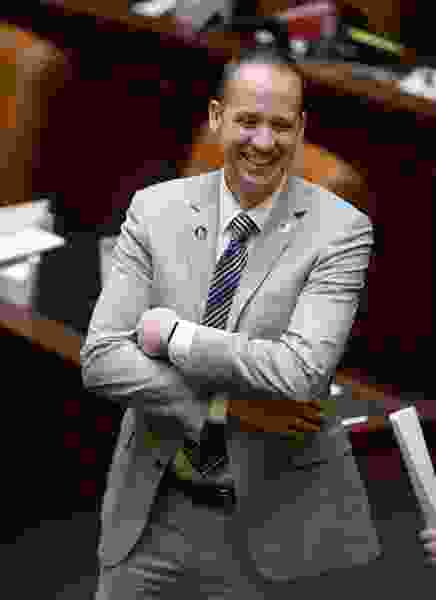 When Fawson was asked if he would consider changes in his bill to require some modesty, he said no — and explained that would change definitions and requirements that have been in Utah law without problem for decades. “In the 23 years that it has been law, we haven’t heard of widespread pornographic feeding frenzies, if you will, of mothers being overly exposed,” he said. Of note, the committee has only one woman member — Rep. Susan Duckworth, D-Magna. She made the motion to pass the bill. Utah is known as a family-friendly state with high birth rates and big families. But it’s not so friendly when it comes to legally allowing mothers to breast-feed in public. So his HB196, formally introduced on Tuesday, seeks to change that. “I guess it’s surprising to me that we don’t have something like this in place, that we would tell mothers there are places you can’t breast-feed,” Fawson said, adding some constituents and stakeholders asked him to push the bill. Fawson said Utah law already exempts breast-feeding from indecency laws, as 18 other states also do. He said Utah has also taken some other steps to protect moms, including being one of 28 states that provide some protection for breast-feeding mothers in the workplace and one of 17 that exempt them from jury duty. Given the health benefits of breast-feeding, he said it’s finally time to clearly allow it in public and make it easier for mothers.